Hello Irisians young and old! For the new year we will be losing some old events, bringing in some new ones, and dusting off some we haven't seen in a long time! Hold onto your hats and keep your eyes peeled! Welcome all Iris Gamers, it is time to run the gauntlet!! Grab your team of up to 7 players and lets get to hunting the items for the event. Please check the rules for the event that are posted on the forums. 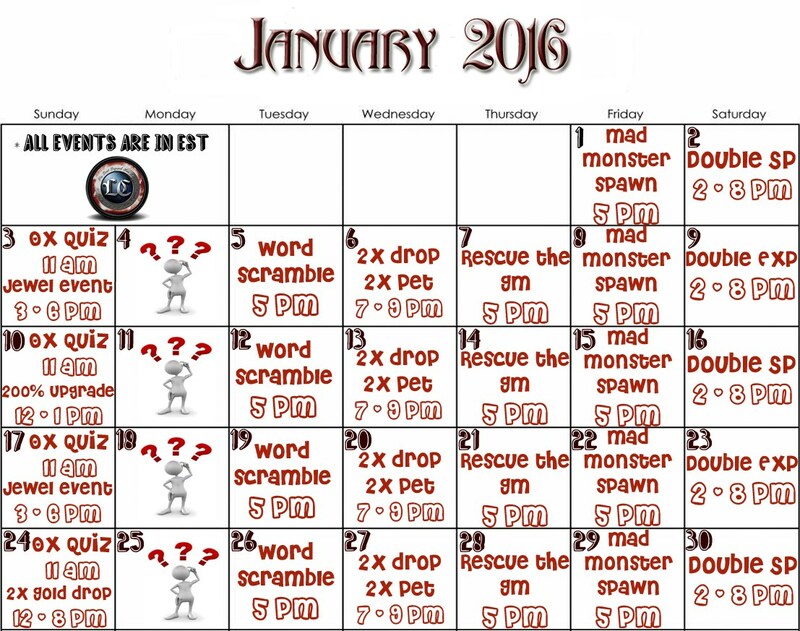 The list that you will be having to hunt for will be posted or announced near the start of the event on January 11th,2016 at 4 P.M. Est. Please be ready to rock the land of Iris. Any other team placing after these before the time limit will receive a consolation prize!! So be fast like Freddy!! Have fun and good luck! LIST of Items to hunt: Twig, Pilferer Scroll, Ring of power, Titan's Broken Axe, Heart of Fluton, Golden Treasure box, Accy of the Gods. Hint: This item falls off of trees, it can be used to get down spider webs so you don't walk into them face first when taking out the garbage. Hint: I wish to be a female wandering nomadic thief from Merac, with this item I can do so. Hint: These Anubii with wings have a special piece of jewelry that we need to play Wonder Twins in the office later. Hint: These titanic warriors hit to hard they have broken their weapon! We have heard you can use this piece to forge a mighty weapon! Hint: Rumor has it his stun is worse than his hit, but this internal organ of his can cure the common cold. Hint: Small maps lead you to this beautiful golden item. Hint: While you are able to gather these Accessories, you will not be able to use them unless you hail from Mount Olympus! If you are not in the 5th floor of Jail (either by running or GM recall) by 4:10pm EST, you will NOT be allowed to participate! Today from 7.00 PM to 8.00 PM EST we will be having a 200% upgrade event! We will have a slew of Jewel Events happening today from 3 to 6pm EST! Please read this carefully to ensure you are on the correct channel for what you want to do! This post has been edited 1 times, last edit by "Vilya" (31. January 2016, 16:42) with the following reason: Word armor removed and GEAR added for clarification.